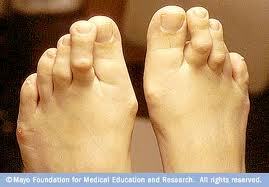 Hammertoe is a deformity of the second, third or fourth toes. In this condition, the toe is bent at the middle joint, causing it to resemble a hammer. Left untreated, hammertoes can become inflexible and require surgery. People with hammertoe may have corns or calluses on the top of the middle joint of the toe or on the tip of the toe. They may also feel pain in their toes or feet and have difficulty finding comfortable shoes. Treatment for the condition typically involves wearing shoes with soft, roomy toe boxes and toe exercises to stretch and strengthen the muscles. Commercially available straps, cushions or nonmedicated corn pads may also relieve symptoms.